Purple-crowned Fairies (Heliothryx barroti) are long-tailed hummingbirds known for their unusually graceful, swooping and lilting flight as they dart from flower to flower sipping nectar. 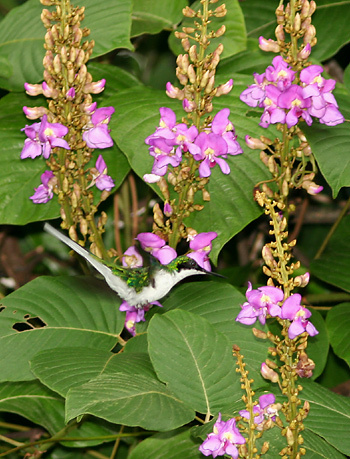 I spotted this female Purple-crowned Fairy in Costa Rica visiting a flowering bean vine. Photographing her was a real challenge as she "danced" around the vine. 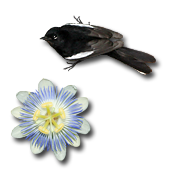 Purple-crowned Fairies are iridescent green above and white below with a black bill and eye mask. Only the males have a small, iridescent purple crown. Both sexes have a long, white-edged tail, but the females like this one have longer tails. Purple-crowned Fairies are most often found at the edges and in the upper canopy of the jungle, as well as in second growth forest. 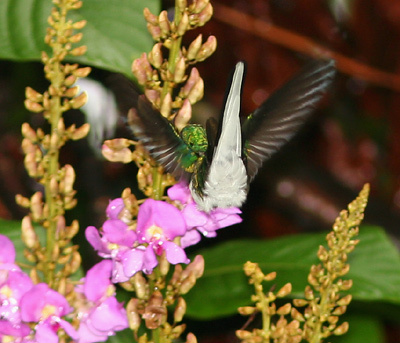 These graceful hummingbirds range from southeast Mexico to southwest Ecuador.